The Eagles Have The Best-Selling Album Of All Time ... For Now The Eagles' 1976 compilation album, Their Greatest Hits 1971-1975, has surpassed Michael Jackson's Thriller for the title of best-selling album of all time. 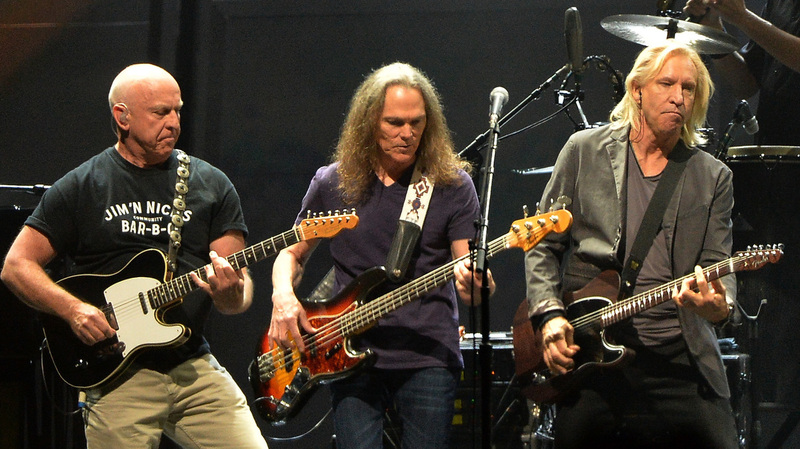 Bernie Leadon, Timothy B. Schmit and Joe Walsh of the Eagles perform during "History Of The Eagles Live In Concert" in October 2013 in Nashville. This is not the first time the Eagles and the King of Pop have battled for the title. In fact, it's been going on for years. The RIAA also reports that the Eagles' Hotel California is now certified 26-times platinum, which places it right behind Thriller. Documentarian Alison Ellwood, who directed the 2013 mini-series History Of The Eagles, is proud of the band she profiled. "I'm thrilled for them, no pun intended, that they've beaten Thriller out and hopefully more people will listen to the music as a result," Ellwood says. "Those songs came to define moments in our lives. They evoke memories. That band had something very magical and the music captures it." Even though the Eagles landed two of the top three slots on the RIAA's list, the band shouldn't get too comfortable. With the exact parameters for measuring album sales always changing and new fans discovering music from decades past all the time, RIAA spokesman Jonathan Lamy notes that the top seller can and will change. "That list is going to be competitive," Lamy says. "You've got to stay tuned. You've got to keep an eye on it because I have no doubt, it's not going to be the exact list it is now in five years." An earlier version of the caption with this story incorrectly identified Joe Walsh as Glenn Frey.